Power cuts in Tamilnadu are known to everyone. Luckily, in Chennai, we get only 2 hours power cut on rotation basis for every month. For this month, the power cut is in the morning. Power cuts in the morning affects me much, since I won't be able to finish cooking on time thus in-turn delays me in getting ready to office. Most often, I go for curries which don't require any grinding and some variety rice which sit wells in the lunch box. Whatever might be the rice or curry, rasam has to be there for all my family members at home. As per them, a meal is not complete without rasam. 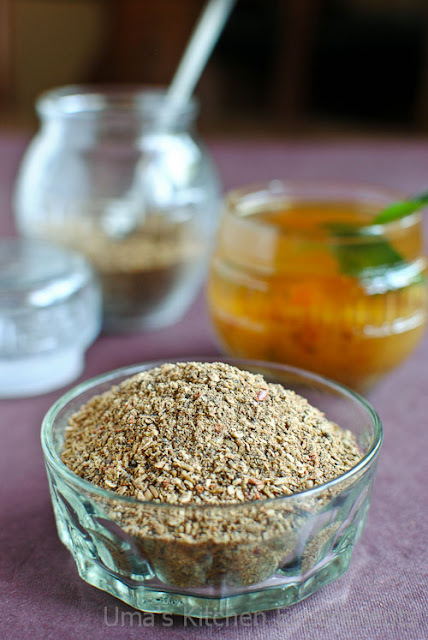 If you know me, I always prepare freshly ground rasam masala everytime when I prepare Rasam. That's one of the reason, I don't prepare and store rasam powder at home. but, power cuts have forced me to prepare and store it in a container for a week's use. My advise will be to prepare it in a smallar quantity to retain its freshness, aroma and flavor. Also, note that I haven't added toor dal in my rasam powder. My mother-in-law usually adds toor dal in all rasam recipes whereas my mom adds only in Dal rasam(Paruppu Rasam) and I have adopted this procedure until now. So, if you want in include toor dal, add 3 tablespoons of toor dal to the below ingredients. 1) Sun dry all the ingredients for an hour. You can also dry roast them in a heavy bottom pan without burning until all the ingredients start releasing nice aroma. 2) In a mixer / coffee grinder, dry grind all the ingredients to a smooth or coarse powder. 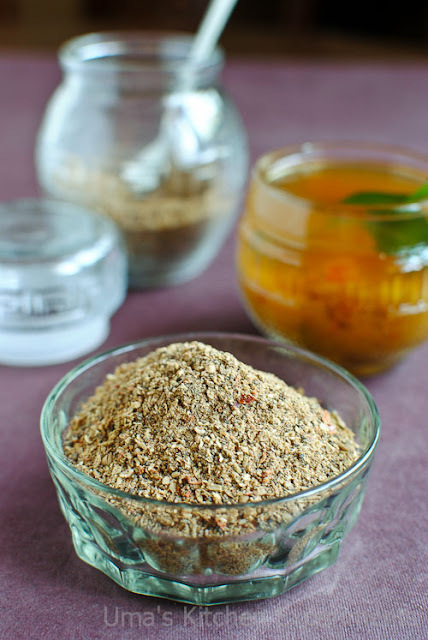 I always want my rasam powder in coarse texture. 3) Store it in an air tight container and keep it inside the refrigerator. It stays good even at room temperature. 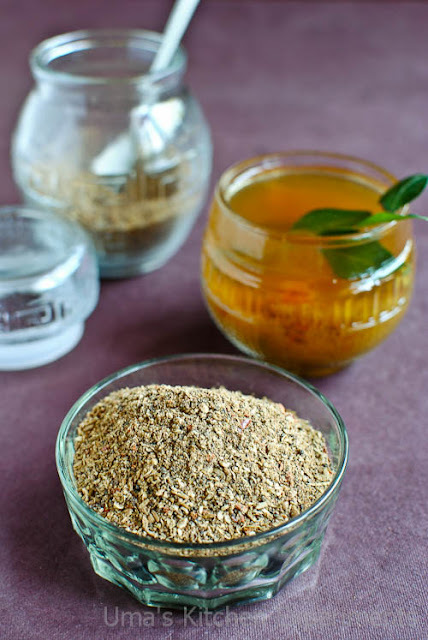 1) If you don't have katti perungayam at home, prepare rasam powder without it and add the asafoetida powder while preparing the rasam. 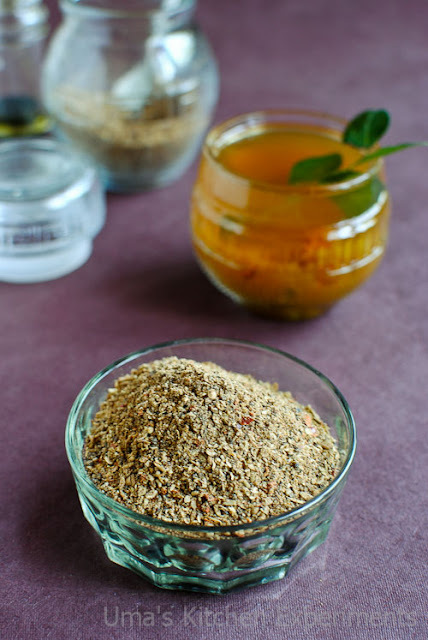 2) If you don't add fenugreek seeds while seasoning the rasam, add it (about 1/4 teaspoons to 1/2 teaspoons) to the above ingredients and make a powder of it. Can guess how it will hard to survive with the power cut na. Homemade rasam powder is always handy and my pantry have it anytime. Yum. yum. yum.... awesome clicks..
A comfort meal is satisfied with rasam. Useful post. love your glass jars!!! nice clicks and useful recipe! !